Attention 10 -14 year olds! 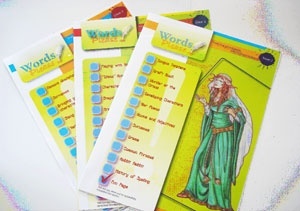 Introducing a new educational website entitled WordsPlease. WordsPlease is a new interactive website designed by education professionals to inspire children with the English language. The monthly subscription website includes a monthly magazine promoting greater levels of reading and writing skill through specified activities and independent projects. Aimed at 10 -14 year olds, WordsPlease builds upon prior learning to enable gifted children to further develop their talents by learning the technicalities of grammar and spelling, whilst being inspired by story ideas, photographs and interviews, amongst other things. It encourages children to write their own stories, poems and non-fiction pieces, incorporating small scale pieces alongside larger projects, such as creating a school magazine or finding a pen pal. It also encourages children to share their work and ideas through drama activities, writing groups and through the WordsPlease Forum, a discussion forum where subscribers can discuss, comment upon and question the writing which they produce. The first month's issue of WordsPlease is completely free and can be accessed through www.wordsplease.co.uk. Simply download the magazine and have a go at the multitude of online activities, including crosswords, language games and character observation. Perhaps this site will cure the literacy deficiencies of the young as officially reported by the EU Commission a few weeks ago (see my article on the Internet of two days ago), but I wouldn't bet on it. Having checked out this site, I think it is really refreshing. It is nice to see a resource specifically targeting those young people who are bright and hardworking. As a teacher I know there are a lot of youngsters out there who just need a bit of inspiration and guidance. I hope this website takes off and gives those people a real focus.